Take charge of your life with hypnosis and overcome your fear of enclosed or confined spaces! Live a life of freedom and feel ok in tight spaces with no anxiety whatsoever! Claustrophobia – the fear of enclosed spaces – can be a debilitating condition.Many people think that it only involves elevators or other small spaces, but in fact many people find they can be overcome by claustrophobia in a large space. My Claustrophobia Hypnosis MP3 can help! This Claustrophobia Hypnosis MP3 download will train your brain to be as comfortable in enclosed spaces as other people so that it does not need to generate anxiety responses for you. 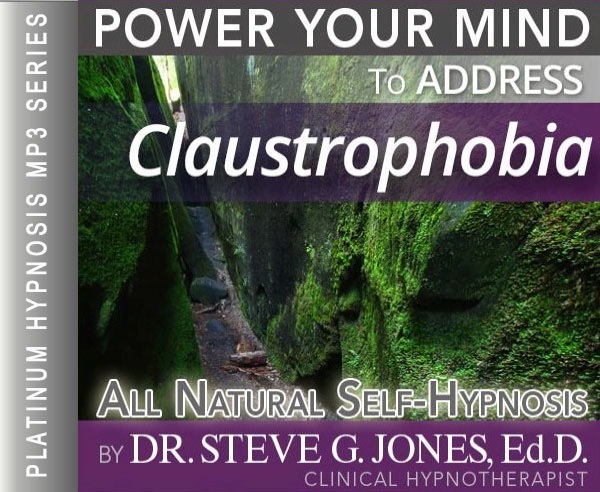 This Claustrophobia Hypnosis MP3 audio is so effective for doing this because it keeps you calm and relaxed while distantly reviewing any difficult situations or experiences, so teaching your mind to respond differently. But you can get all the benefits for this low price. Simply listen to the Claustrophobia Hypnosis MP3 every night as you go to bed for three weeks and feel the changes happening in your life. You will feel more empowered, more in touch with your true self, and you will truly know that your goals are within your reach. Even though I don’t suffer from claustrophobia, I think we’ve all felt claustrophobic before in certain situations. Whether on an airplane or a concert or in a small room or an elevator, it’s easy to feel overwhelmed. However, people with a diagnosis of claustrophobia feel more than just uneasy. Many people suffering from claustrophobia develop panic attacks when put into a situation where they feel uncomfortable. Hypnotherapy is a great way to treat the fear of being in a confined space. Hypnosis is a natural way to train your brain that it CAN feel comfortable in a small space. You do not have to suffer from claustrophobia! Imagine flying on an airplane or riding on an elevator feeling so calm and so relaxed. Hypnosis can help you achieve this so that you learn to control claustrophobia and no longer suffer from it. Experiencing claustrophobia is a scary experience. However, with hypnotherapy you can target your fear of small and/or crowded places in order to feel comfortable in any situation. You no longer have to live in fear of confined spaces because hypnosis will help you overcome claustrophobia so that you can get back to living a more normal life. Hypnotherapy is a great way to target any fear because it allows you to simulate the experience with control. For example, the Claustrophobia Hypnosis MP3 program allows you to see yourself in a small and crowded area and it helps you cope with your emotions during the situation. This experience prepares you for the unknown so that you do not have to live in fear of small spaces. Claustrophobia is a fear and fears are all about your cognitive thoughts and feelings. Hypnotherapy allows you to access these fears in a controlled environment so that you can change the way you feel about small or crowded places. With the help of hypnosis you can change negative thoughts and reactions into calm and positive thoughts and reactions. You do not have to live your life in fear! We suggest that you listen to this powerful hypnotherapy program for 21 nights in a row before going to bed. You may start to see results in as soon as one day! Remember, you are always in control and hypnosis will help you feel in control of your fear so that your fear dissipates and you no longer have to deal with claustrophobia.